Guido De Bortoli/Getty ImagesPerformix House not pictured. Performix House is the latest gym to hit New York City’s elite fitness scene, attracting celebrities and fitness influencers. According to the New York Post, perks include cryotherapy chambers, a private entrance, and a content studio for fitness influencers to film their workouts. If you pass the rigorous application process, membership can cost up to $US900 – but nonmembers can pay $US24 to $US40 to attend some classes, as long as they use a separate entrance. A new gym has hit the New York City fitness scene and it’s a hit among celebrities and fitness Instagrammers. So says The New York Post, which recently published an inside look at Performix House, a new gym where prospective members must prove their worth as a gym member by applying online, interviewing with the director of membership, undergoing a consultation with a trainer, and getting their Instagram feed reviewed to see if they’re serious about fitness and living their best life. If approved, members pay for one of three tiers: $US250, $US400, and $US900. While the bottom packages offer limited amenities to be paid for a la carte, the highest tier gets you all the luxuries in the 8,000 square-foot gym located near Union Square. 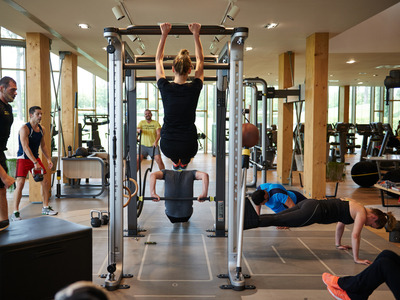 According to the Post, that includes a private entrance in the back, access to top trainers, an AstroTurf area to work out in (perfect for Olympic athletes), recovery area with 3D imaging machine, locker rooms complete with Netflix and cryotherapy chambers, and a content studio, where fitness influencers can take advantage of lights and cameras to film their workouts for social media, among other perks. Hesse likened the studio to a set when speaking with the Post. But fitness influencers aren’t the only ones out of the 240 members (selected out of 1,000 applicants since the gym’s opening in February) to belong to Performix House. Celebrities, including actor Mark Consuelos, are also regulars. He plans to limit membership to 500 people, although Performix House does open its doors to nonmembers for classes that cost $US24 to $US50 a pop, reports the Post. The only catch is that those doors are a completely different entrance than the ones its members use. And, despite its exclusive application process, it doesn’t matter what members look like.